As far as employee benefits are concerned, healthcare is one of the biggest. It's no wonder that when people are job hunting, after compensation, healthcare is one of the first things they ask about. This is particularly true for employees living with arthritis. Canadian employers, working with their private health insurers, are also increasingly looking for ways to promote patient-focused prevention, treatment and management of chronic disease as part of a health and wellness program for employees. To recognize the best arthritis practices and most innovative initiatives to raise arthritis awareness, Arthritis Consumer Experts (ACE) is pleased to announce the winners of our second annual search for Canada's Best Workplaces for Employees Living with Arthritis. As part of its examination of arthritis issues in the workplace in this edition of JointHealth™ monthly, ACE also looks at recent policy changes in the private health insurance that potentially could affect employees living and working with arthritis. ACE's "Best Workplaces" program in 2015 accepted more than 60 submissions for company work environments that consider the unique needs of employees living with the most common disease in the workplace and the leading cause of disability – arthritis. To identify Canada's Best Workplaces for Employees Living with Arthritis, ACE, together with its Scientific Reviewer, Arthritis Research Canada, evaluated submissions from employers and employees from across Canada. Using an extensive evaluation process, ACE has awarded Simon Fraser University, L'Oréal Canada and High Liner Foods for their best arthritis practices in the workplace and their commitment to investing in employees' health and well-being. 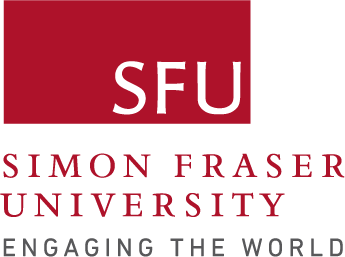 Simon Fraser University (SFU) is Canada's leading comprehensive research university and is ranked one of the top universities in the world. With campuses in British Columbia's three largest cities, Vancouver, Burnaby and Surrey, SFU has eight faculties, delivers almost 150 programs to over 35,000 students and employs more than 6,500 full and part-time faculty and staff. The University offers a variety of support to persons with disabilities by providing a disability management program, disability accommodation policy, health and wellness services including workshops. The Burnaby campus provides employees with access to Athletic and Recreation classes and state of the art exercise equipment and facilities. We are honored to be recognized by ACE as one of Canada's Best Workplaces for Employees Living with Arthritis," said Dario Nonis, Executive Director, Human Resources, Simon Fraser University. "One of Simon Fraser University's (SFU) important goals is to maintain a healthy workplace for all employees. We recognize that our employees are our most valuable asset. Paying attention to employee well-being helps individual employees, and also strengthens the organization as a whole." L'Oréal Canada Inc., a wholly-owned subsidiary of Paris-based L'Oréal SA, the largest cosmetics and personal care products company in the world. L'Oréal Canada keep its 1,200 Canadian employees happy by encouraging them to achieve work-life balance through a variety of alternative work arrangements including flexible hours, telecommuting, compressed work weeks and early Friday closings in the winter and summer. The company also maintains a flexible health benefits plan that allows employees to customize levels of coverage to suit their personal needs. At L'Oréal Canada, we take great pride in offering the best quality health and wellness benefits to all our employees. This is reflected especially in our Share and Care program, which aims to offer security and protection to each and every L'Oréal employee, based on standards of social excellence. The objective of our Share and Care program is to offer the best benefits in four areas: social protection, health, parenthood and quality of life at work. This program is a true reflection of our commitment to our employees and their well-being," said Eva Azoulay, Vice-President, Human Resources, L'Oréal Canada. With its corporate offices and its Canadian plant operations located in Lunenburg, Nova Scotia, High Liner Foods is the leading North American processor and marketer of value-added frozen seafood. With more than 1400 full-time employees, High Liner Foods is committed to employee health and wellness, including progressive employee/family assistance programs, providing the services of a dietician, smoking cessation products and employee involvement in benefit plan design. High Liner Foods recognizes and supports the importance of balancing work, life and wellness. In support of this balance, High Liner Foods offers various health and wellness policies and programs, including our flex benefit plan, which gives employees options based on their individual life circumstances and needs." said Joanne Brown, Executive Vice President, Human Resources, High Liner Foods. Healthy food options in cafeteria or vending machines. The transparency about the reasons for selection in our Best Workplaces program means the nomination and interview process helps shine a light on progressive employers, while allowing other organizations to discover, and hopefully emulate, what they are doing well in terms of arthritis best practices," said Cheryl Koehn, President, Arthritis Consumer Experts. She adds: "Based on our experience the past two years running this program, we are finding there is a ripple effect where employers appear to learn from one another, creating new internal practices and, in some cases, raising expectations, such as for arthritis education and screening programs in the workplace. There are always new ways to improve arthritis awareness, whether through small or large changes." As employees indicated to ACE during interviews, health and wellness benefits, these days, are extremely important. As healthcare costs continue to rise, some employers have reduced the portion of employee healthcare coverage they pay for. That hasn't been the case for the majority of businesses that were nominated for ACE's "Best Workplaces." In fact, most of the nominated companies pick up at least 80 percent of the cost of employees' annual healthcare premiums. Many of the companies, including L'Oréal Canada and SFU, continue to cover 100 percent of the cost of their employees' healthcare premiums. At the same time, the vast majority of our nominated companies continue to cover a wide variety of other health benefits. More than 9 in 10 top workplaces offer dental, vision, mental health, and prescription drug coverage as well as coverage for alternative treatments such as acupuncture and chiropractic care. As healthcare costs creep up, more top workplaces are also offering health and wellness screenings and other incentives to keep employees fit and feeling good. Commenting on the value of workplace health and wellness, Cheryl Koehn said: "Creating a healthy workplace is no easy task in today's demanding work environment. The organizational benefits of a healthy workplace are many—including reduced healthcare costs, improved productivity, and increased employee attraction and retention. This program has revealed to us the evolution of corporate Canada's arthritis awareness and examples of prevention and treatment in action and truly is one of the most engaging aspects of the project." Arthritis is the most common cause of work disability in Canada and typically occurs during prime working years, between ages 35-50. According to the Arthritis Alliance of Canada, arthritis costs the Canadian economy more than $6.4 billion annually. Lost workdays due to long-term disability account for approximately two-thirds of this total. One in six Canadian employees has osteoarthritis. That number is expected to rise to 1 in 3 Canadians by 2020. One out of every 136 Canadian workers lives with rheumatoid arthritis (RA), but that will increase to 1 in 68 workers by 2020. Within ten years of the onset of RA, up to 50% of employees living with RA are work disabled if left under- or untreated. Dr. Diane Lacaille of the Arthritis Research Canada has conducted studies to determine what workplace factors are closely linked to the risk of a work disability lasting six months or longer. She found that high physical demand, low job independence (i.e. minimal control over the pace of work and how duties are performed) and poor support from co-workers aggravated arthritis symptoms and accounted for longer absences from work. In September 2015, one of Canada's largest private health insurers, announced a new oversight program that will change the way it will monitor and evaluate new medications coming to the market in an attempt to help plan sponsors (e.g. employers) contain rising drug costs. This new policy will not list new Health Canada-approved drugs considered "high cost", such as biologic response modifiers for inflammatory arthritis, to its formulary in a timely manner. Instead, the high cost drugs will be placed on a "watch and wait" list until the public drug cost-effectiveness review process – a lengthy process that often takes up to a year – makes a determination about the drugs' affordability. What do these changes mean for employees living with arthritis, the leading cause of disability in Canada? 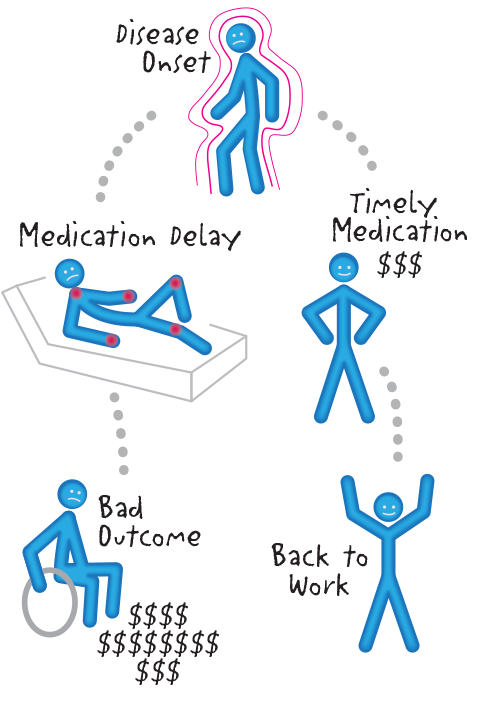 For employees living with inflammatory arthritis, such as rheumatoid arthritis, psoriatic arthritis and forms of spondylitis, this new set of policies potentially restricts timely and appropriate access to necessary medications and represent short-term solutions for cost savings that in the long term could generate negative health outcomes for employees. Another significant cost driver in the employee population with inflammatory types of arthritis is presenteeism, or reduced productivity while at work, which costs four times more to employers than time missed from work (i.e. absenteeism). Current research proves irrefutably that timely treatment initiation in employees with newly diagnosed rheumatoid arthritis or those with rheumatoid arthritis who do not respond (or respond poorly) to older, less powerful treatments is essential to achieving optimal health outcomes and keeping people on the job, and that delays in getting the treatment needed leads to greater risk of work disability down the road. For those employees who need them and quickly, biologic response modifiers are the most effective treatments available today and have the ability to, in some cases, arrest the disease. Studies in rheumatoid arthritis show that a delay of more than 12 weeks from symptom onset to therapy initiation results in a lower chance of going into remission and an increased chance of progressive joint damage. A "watch and wait" approach runs contrary to all of this scientific evidence and will result in employees, with inflammatory arthritis who rely on private health insurance, enduring pain and joint damage and landing on employers' permanent work disability cost column. "Waiting" for effective drugs to be made available to people with uncontrolled inflammation is contrary to the evidence that a patient's response to therapy declines the longer the wait. ACE fully appreciates the private insurance industry is facing its own crisis: sustainability. In our ongoing discussions with private payers and the Canadian Life and Health Insurance Association, we often hear about the industry's commitment to providing timely reimbursement of the best medicines to achieve the goals of preventing permanent disability and loss of employment. ACE will continue to meet with these decision makers to ensure they fulfill that important commitment to the thousands of employees working with arthritis in Canada.